Always ASK FOR native plants. Statewide network of native plant business professionals. FANN members at a spring social gather to kick off our new name and logo. AFNN became FANN in 2011. Since 1986, the Florida Association of Native Nurseries (FANN) has been the industry leader in growing, planting and restoring Real Florida. “Florida Friendly” for thousands of years, our plants are your first choice for a landscape that conserves water and energy, supports wildlife and pollinators, and looks like Real Florida. 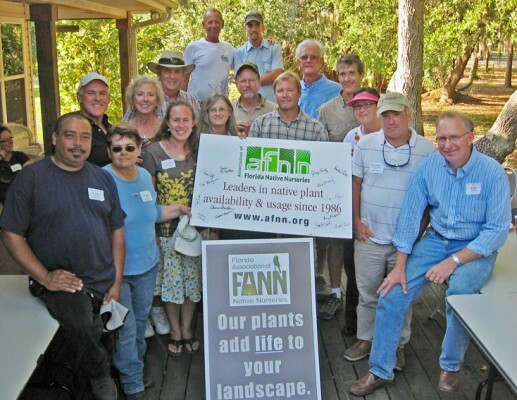 FANN is a professional trade association and our members include growers, retail nurseries, landscape professionals, environmental consultants, allied product and service suppliers and nonprofit supporters of the native plant movement. Come to us for native plants and expertise in using them. If you’re in the native plant business — whether it’s growing, planting or promoting — you should be part of FANN. Join us. Are you a gardener? Love native plants and the idea of restoring Real Florida? You can help by donating to the Native Plant Horticulture Foundation. Native plants are to the landscape as healthy local foods are to eating. Our native plant industry is about where the healthy local foods movement was 50 years ago. We need to learn how to produce higher quality plants, in greater volume, distribute them to the market and most importantly, engage new young people in the profession. That’s a tall order! But with your help, we will acquire the resources for education and research to make it happen. Big shout out and THANK YOU to our Florida Department of Agriculture & Consumer Services (FDACS), who assisted us in obtaining USDA Specialty Crop block grant funding to promote the increased use of native plants. This funding has been used to develop this website and the great 30-second public service announcement below. FANN is a proud member of Florida’s Agricultural Industry and FDACS’ Fresh from Florida Campaign promoting Florida-grown agricultural products. Tell your friends with cable TV to watch for the FANN spot and … plant Real Florida!